How much ink is there left in your HP 980c cartridges? One day your HP 980c will gobble up all of your printer ink, and when that does happen you'll quickly learn that replacing HP 980c ink may be pricey. You don't need to lose any sleep about paying the high asking prices you'll see on the main street because now at Cartridge Save you can pick up all the HP 980 c cartridges you'll want at very small prices. Spend less cash on your ink by purchasing with Cartridge Save! Why spend so much on the 980-c original cartridge or 980c compatible ink in the high street when it is much more straight forward to save a pile of cash ordering online with Cartridge Save. Enjoy perfect confidence by ordering your DeskJet 980c ink cartridges from us as each one is underwritten by a no quibbles money back guarantee. Remember that every single purchase has free delivery, most likely delivered the following business day! 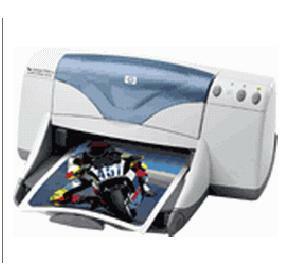 The HP Deskjet 980c is one of the older single-function inkjets in the market, yet remains to very reliable. Basic and easy to use, it offers good quality colour and monochrome prints. It may not be the fastest, but it renders a maximum resolution of up to 2400x1200 dpi, making it an excellent choice as a personal or even home office printer. The HP Deskjet 980c can be used with most Mac and Windows operating systems. The only downside is that it does not have wireless connectivity, being an old model. The HP Deskjet 980c's unique shape separates it from the usual box-type devices from the same manufacturer. It features a simple control panel consisting of only 3 buttons, and the input tray and paper catch is right in front for easy paper handling. The HP Deskjet 980c measures approximately 17x8x14 inches and boasts 8 MB of built-in RAM. The HP Deskjet 980c prints at a rate of 17 ppm and 13 ppm (black and colour, respectively, in high resolution). It is not the fastest but it is still above average. This model boasts a 5000-page monthly duty cycle, making it a reliable tool in a home or small office setting. Ink price will always be an issue for inkjets like the HP Deskjet 980c, but households with minimal printing needs will find it economical to use. Being a single-function unit, the machine is more appropriate for personal use than for business or office use.